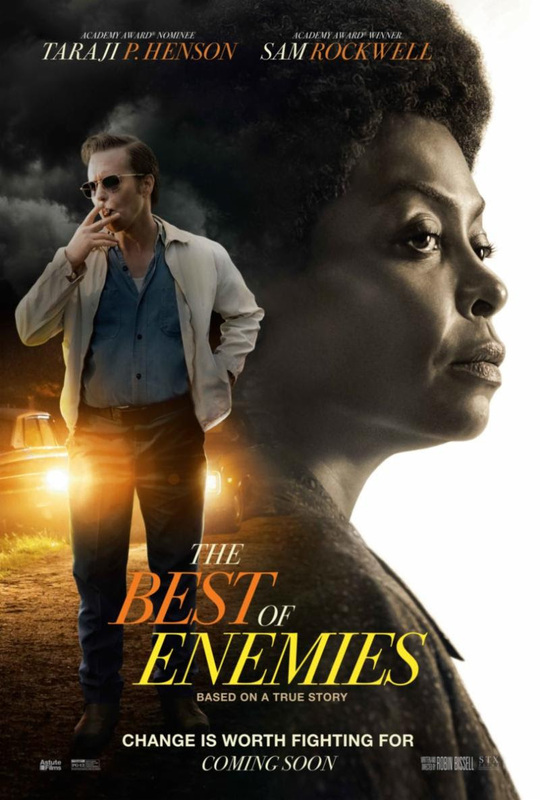 Perhaps the greatest thing to come from the film “The Best of Enemies” will be that a few more people will know about real-life, grassroots activist Ann Atwater (Taraji P. Henson). Atwater fought for renters rights, and other small town causes throughout her life. When her daughter’s school the “black” school is greatly damaged in a fire she takes her activism to a greater height. She wants the schools in town to merge and integrate. In 1971 Durham North Carolina the Ku Klux Klan is in control of the politics of the land. The leader of the Klan in town is C.P. Ellis (Sam Rockwell). He runs a whites-only gas station and keeps a close eye on all of the community happenings. When the activist Ann Atwater puts forth a proposal for the schools to integrate, Ellis decides to get involved. Sam Rockwell, Babou Ceesay and Taraji P. Henson at the Charrette. The town holds a charrette in an attempt to come to a fair and just decision on the matter. Once the decision is made, the entire town must agree to adhere to it. The charrette is made up of 6 participants arguing for integration and 6 arguing against it. They meet for weeks and share ideas, opinions, and information all to culminate in a vote at the end. As with any historical movie and most race-related movies, the outcome will not be a surprise, but it is rewarding to watch a tide of hatred be quelled. There is some forced tension between Ellis and his Klansmen that doesn’t feel authentic. Ellis’s wife (Anne Heche) doesn’t look period appropriate and there is no chemistry in their marriage. Very little personal life of Ann Atwater is shared and when it is, it is often through the eyes of Ellis. Despite its weaknesses, the strong lead performances and the celebratory ending give the film a charm that many will be drawn to. Previous Sign Of The Times: Research on emerging adulthood.